Watch Hoop Days full episodes online English Sub. 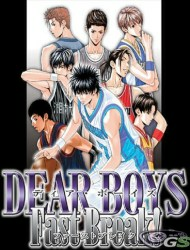 Synopsis: Aikawa Kazuhiko was the captain of Tendoji high school prestigious basketball team. He moves into a new town to attend Mizuho high school and joins its basketball team. However, Mizuho high’s basketball team is far from being prestigious, in fact, it’s now defunct. Nevertheless to say, Kazuhiko’s persistence, passion and basketball skills inspired other team members of the dysfunctional basketball team to gear up and start practicing again.